Betfair Europa Final offers are now live. 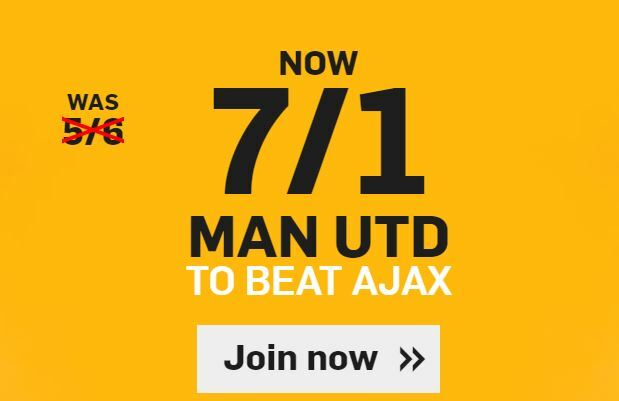 Get Man Utd to beat Ajax 7/1 or 20/1 (vas 10/11). Massive value on the £10 offer as they are currently evens to win after 90 mins. This is a new customers offer only. 1€ max. stake. All winings will be paid in free bets. Free bets are valid for 7 days. Yo can only qualify for this once. Only your first bet placed on the event is eligible for enhanced price. Exchange bets and bets as part of multiples are not included. Ony deposits made using Cards/Paypal will qualify for this promotion. This offer ends today at 19:45. • You can only take part if your account is registered in the UK or Ireland. • You can only take part using one account. • If we find that you have used more than one account to participate, we reserve the right to withhold any winnings earned on the duplicate account. • Bets placed using free bets as the stake (in full or in part) will not qualify. • Only deposits made using Credit/Debit Cards or Paypal will qualify for this promotion. • You can qualify for a maximum of one bet on the enhanced price per customer. 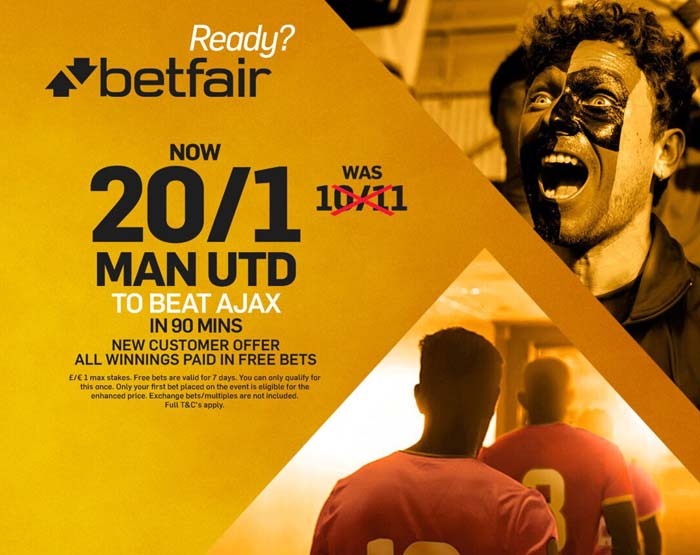 • Place a bet on Man Utd to beat Ajax in the ‘Match Odds (90 mins only)’ market at the enhanced price. • Max stake £1. Only the win part of Each Way bets count towards promotion. • Only your first bet placed on the event is eligible for the enhanced price. • Exchange bets and bets as part of multiples are not included in this promotion. Betfair will payout your winnings ENTIRELY IN FREE BETS within 24 hours IF your bet is successful. Free bets are valid for 7 days. • Selections in permutation multiple bets (Patent, Yankee, Lucky 15 etc) do not count. • Winning Example: Enhanced 20/1 x max £1 = £20 paid in FREE BETS plus £1 qualifying stake returned as CASH. This offer terms and conditions are the same as the one above.